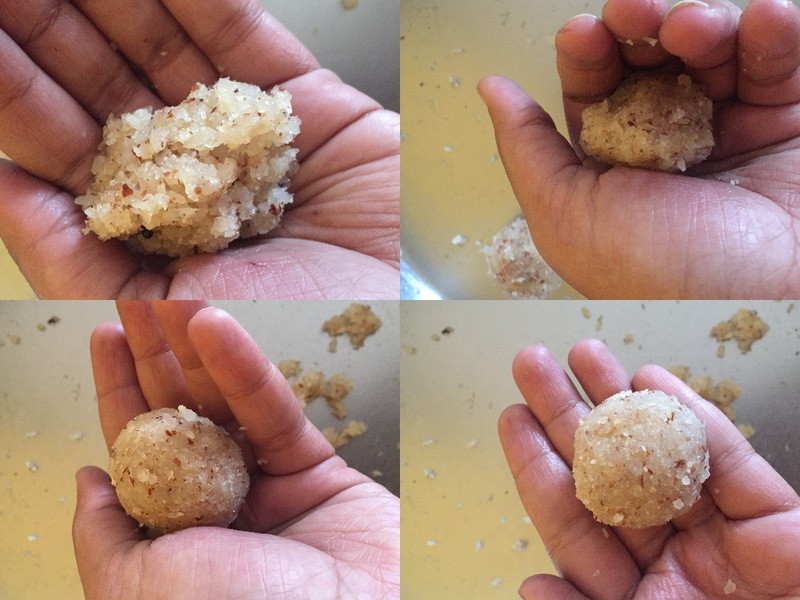 Coconut Laddu Recipe with step by step photos. Coconut is a very versatile ingredient. It can be used in several ways for both savoury and sweets. Coconut laddu recipe is one of the simplest and delicious coconut recipes that I can think of. It is prepared with just three core ingredients i.e., coconut, sugar and milk. 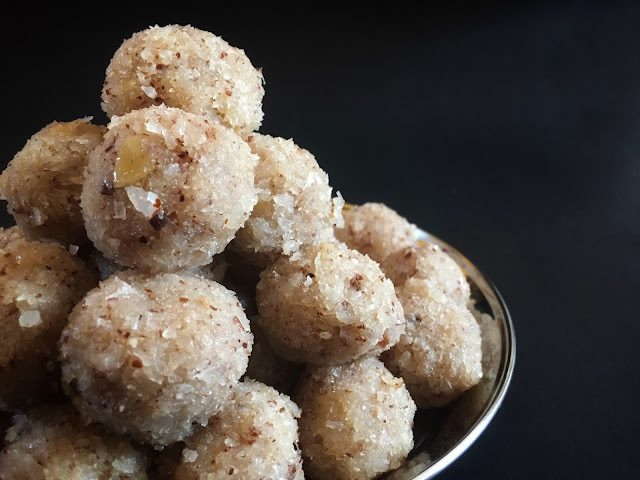 In this coconut laddu recipe, I have added cardamom and cashews apart from the three core ingredients. You can experiment with the dry fruits. Melon seeds also taste good with coconut laddus. You can also give it a twist by adding rose or pista or any other flavour of your choice! Blend roughly chopped coconut. Don't add water. You can also use desiccated coconut or grate fresh coconut. Put it in a kadhai. Add milk. Cook it on medium flame. Stir occasionally. This will take more than 30 minutes. Stir often when the milk thickens. Add dry fruits and Cardamom(elaichi) powder. In this recipe, I have added cashews only. However, you can add any dry fruit of your choice. Melon seeds also taste very good with these laddus. Press this mixture with the back of the spatula. Check if milk is coming out. If no then good to go otherwise keep on stirring it until mixture is really dry. Make sure that you don't hurry for this step. If mixture will not become dry then it will become impossible to shape laddus. Once the mixture is dry, transfer it to a plate. Spread it. Let it cool down a bit. Once your mixture is slightly cool and you are comfortable working with it, then start shaping laddus. For this, you need to take some mixture. Press it really tight first then start giving it round shape. Put it in a kadhai. Cook it on medium flame. Stir occasionally. This will take more than 30 minutes. Stir often when the milk thickens. Add sugar. You can also use jaggery powder instead of sugar. Add dry fruits. In this recipe, I have added cashews only. However, you can add any dry fruit of your choice. Melon seeds also taste very good with these laddus. Add elaichi powder. Mix it well. Press this mixture with the back of the spatula. Check if milk is coming out. If no then good to go otherwise keep on stirring it until mixture is really dry. Don't hurry for this step. If the mixture is not dry then it will become impossible to shape laddus. Once the mixture is dry, transfer it to a plate and spread it. Let it cool down a bit. Once your mixture is slightly cool and you are comfortable working with it, then start shaping laddus. For this, you need to take some mixture. Press it really tight first then start giving it round shape. The mixture should be very dry before you start making laddus. If you are using jaggery instead of sugar then add it towards the end of the process. Otherwise, milk might curdle after adding jaggery. Amount of sugar or jaggery can be adjusted as per taste. Quantity of sugar/jaggery can be altered as per taste.